Your hair is grayer than it was back then. You’ve both packed on pounds here and there, too. A few wrinkles surround your smiles, but that’s okay – you’re not fresh-faced kids anymore. You’ve aged, you’ve softened and, in the new book “Transitioning Together” by Wenn & Beatrice Lawson, you’ve changed quite a bit. Long before they met, Wendy and Beatrice had a lot in common: both came from families of similar sizes. Both had fathers that “didn’t have a head for figures” and mothers who ran the family businesses. Wendy and Beatrice are both on the autism spectrum. The main difference: Wendy was a married woman. They met one afternoon when Wendy, her husband, and their four children were living in the home of a “well-to-do” family that had just hired an au pair. The shy young woman didn’t speak English and Wendy didn’t speak Swiss German, but when Wendy was asked to help the girl settle in, Beatrice proved to be a quick study. She easily learned a new language and she and Wendy forged a close friendship. Both seemed only a little surprised when that friendship turned into love. Wendy, who’d had health issues most of her life, never considered falling in love with another woman, but it felt right. Beatrice had an inkling that she was a lesbian but she shunned the word, afraid that it would “be an embarrassment” to her family. Even so, she settled into a relationship which was tender and fragile from the start. Wendy and her family moved from England to Australia as her abusive marriage was crumbling. Beatrice was unable to make the move with her beloved, due to Australia’s immigration laws. They ultimately figured out a way to be together physically; once Wendy’s divorce was final, they knew they’d be together legally as well. But even after their wedding, Wendy wasn’t happy. Never comfortable in her body, she felt sure that something was missing, so she sought her “tribe” before understanding that she needed to transition to become the man he’d always known he was. 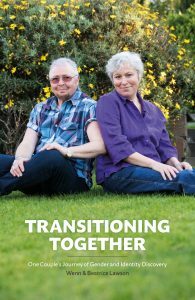 From its beginning, “Transitioning Together” is a tough read. There’s a lot of preliminary to wade through to get to the start of the actual story here, and then there’s a lot of confusing set-up that identifies authors Wenn and Beatrice Lawson by their relative ages, rather than by name. While it’s helpful, later, to have a change in font to delineate who is weighing in, you might continue to be baffled by the semi-linear nature of what is mostly Mr. Lawson’s version. Yes, tenacious readers who can bear with this dual memoir will get a double-edged peek at the emotional process of transitioning for both partners, through the added, unique perspectives of autism and age. That’s worth the patience – if you have it. Indeed, this book could be more for professionals than for anyone else; general audiences may enjoy “Transitioning Together,” but only by a hair.